What an odd thing to say. Who killed Robin Williams and what was it to distract us from? 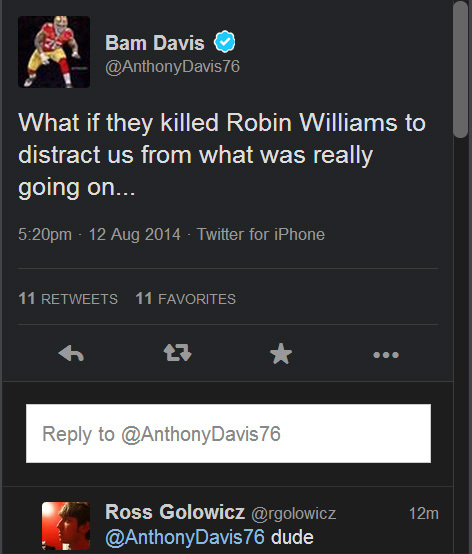 Davis is notorious for tweeting things that either anger or confuse people. This is another one of those. The reaction, of course, was of confusion and shock. @Tyl49er it was gonna be taken wrong and spun to make me look crazy due to everyone else's fears and closed mindedness. This entry was posted in NFL, San Francisco 49ers and tagged Anthony Davis, Robin Williams. Bookmark the permalink.